As you probably know, Excel allows you to save a workbook in a format for earlier versions. In addition, you can save a workbook in a dual-version format that combines two file formats in a single file. These dual-version formats result in a larger file, but unfortunately, these dual-version formats sometimes introduce problems of their own. ♦ Microsoft Excel Workbook (*.xls): The standard Excel 2003 file format. Can be opened by Excel 97, Excel 2000, Excel 2002, and Excel 2003. ♦ Microsoft Excel 5.0/95 Workbook: A format that can be opened by Excel 5.0 and later versions. ♦ Microsoft Excel 97-2000 & 5.0/95 Workbook: A dual format that can be opened by Excel 5 and later versions. ♦ Microsoft Excel 4.0 Worksheet (*.xls): Can be opened by Excel 4 and later versions. This format saves a single sheet only. 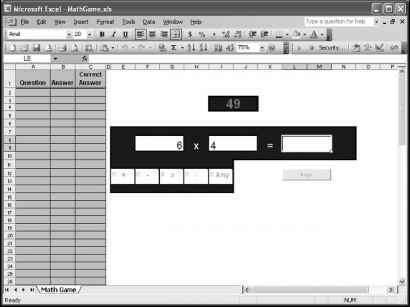 ♦ Microsoft Excel 3.0 Worksheet (*.xls): Can be opened by Excel 3 and later versions. This format saves a single sheet only. ♦ Microsoft Excel 2.1 Worksheet (*.xls): Can be opened by Excel 2.1 and later versions. This format saves a single sheet only. ♦ Microsoft Excel 4.0 Workbook (*.xlw): Can be opened by Excel 4.0 and later versions. This format saves multisheet files, but they are not the same format as Excel 5 workbooks. Table 26-1 lists the constants and values for various Excel file formats.